A soccer field, volleyball and basketball courts, two tennis courts, a badminton court, two tennis tables, and an open air gym—AUBGers will enjoy all that starting fall 2016 semester. The new outdoor sports facilities will be the perfect place for the variety of sport activities traditionally taking place at the university. The new outdoor sports facilities complete the Student Center project that was generously supported by the America for Bulgaria Foundation. In addition to the courts, tennis tables and gym, the new facilities will also have a service building connected with an underground water reservoir and storage space. 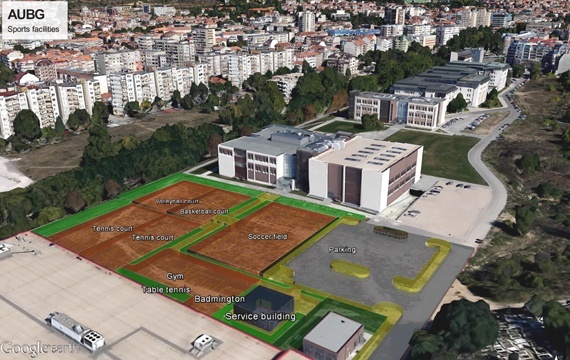 The facilities will be available for all members of the AUBG community— students, faculty and staff. AUBG has a long-established tradition of supporting events and activities dedicated to healthy living and sports spirit. The university offers a variety of fitness programs and students organize a number of tournaments and intramurals. For more than 10 years now, the AUBG Olympics club gathers the whole university community for a grand sports event that includes 15 disciplines and welcomes some of Bulgaria’s most famous athletes on campus. 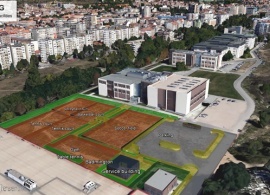 “The new playing fields will be a great addition to the sports spirit at AUBG,” said Dimitar Bratovanov, AUBG student and member of the AUBG Olympics crew. The new facilities will further promote the active lifestyle on campus and will give students the opportunity to practice their favorite sports outdoors, he also said. AUBGers have also established a Soccer League that consists of 13 student teams and one championship. The new facilities will come in handy for the soccer enthusiasts.